Pelican Products has protected defense, emergency and scientific expedition equipment through some ofthe harshestconditions on Earth since 1976. This same DNA is now available to you in Pelican™ Elite Coolers. We hold ourselves to higher criteria than other cooler makers. When it comes to durability, performance and ergonomic design, just “good enough” doesn’t cut it. As a result, Pelican™ Elite Coolers perform to higher standards — better than any cold locker, tougher than any icebox. 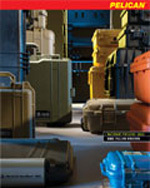 Pelican™ Elite Coolers are true next-generation innovations, created to last a lifetime. From the latches to the freezer-grade seal to the toughest handles in the business, every part is engineered to our extreme durability and performance standards. Which is why we feel confident in providing you with a Lifetime Guarantee. Not three years. Not five years. A lifetime. Something the other makers don’t (or can’t) do. Whether you’re on the hunt of a lifetime, far out at sea with a cooler full of catch, crossing deserts on safari or simply tailgating during a big game – the Pelican™ Elite Cooler is the one for you.